Reality lies just under the surface, however. We have one of the most persistent rallies in history that’s coming to an end. We’ve been stalking a short entry for awhile now, but it isn’t going to happen until the last subwaves have played out. If you look at the SP500, you know we’re close. In fact, we’re in the fifth of the fifth of the fifth, with a pattern that threatens to move sideways to slightly up until the underlying positive social mood turns down. We’re in a triangle—whether a contracting triangle, or an ending diagonal is still to be unveiled. That’s the situation on the NYSE side of the equation. On the Nasdaq side, we’ve just completed an impulsive first wave up of an expected five wave move to the final high. But the impending trend change doesn’t just involve the US market; it’s an international phenomenon. The DAX is threatening a trend change after what appears what could be the start of a first wave down already in place. Whether we have one more top here is questionable. Other indices are showing extremely bearish patters: FTSE and TSE are great examples. For almost two years, I’ve been talking about “all the same market,” which means that all assets are gradually move closer and closer in parallel moves to a final high. Over the next couple of days, you’re going to see just about every asset class move into the final subwave heading for the final change in trend. USD currency pairs are all within hours of bottoming out (USDCAD and USDJPY, which move opposite the other USD currency pairs are topping, of course). WTI oil is at the bottom of a fourth subwave with a final high in its sights. Gold and silver have dropped, as expected, into their final waves down before they bottom. I’ve been predicting their bottom with the top in the US indices. 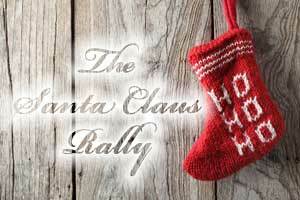 It looks like Santa is coming to town for the usual seasonal rally. I expect a final rally to last through the holidays, with a top expected either at the end of the year, or into the very early part of 2018. 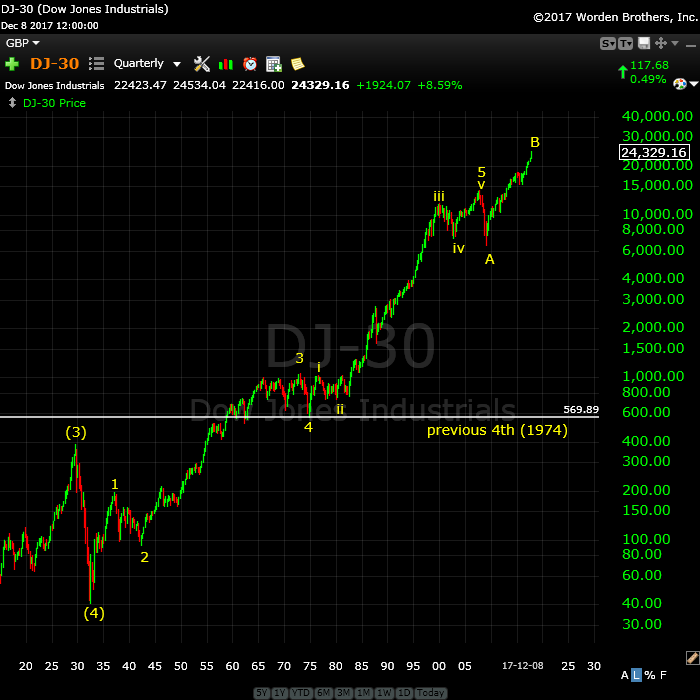 Above is the quarterly chart of the DOW as an arithmetic chart. A bubble perhaps? 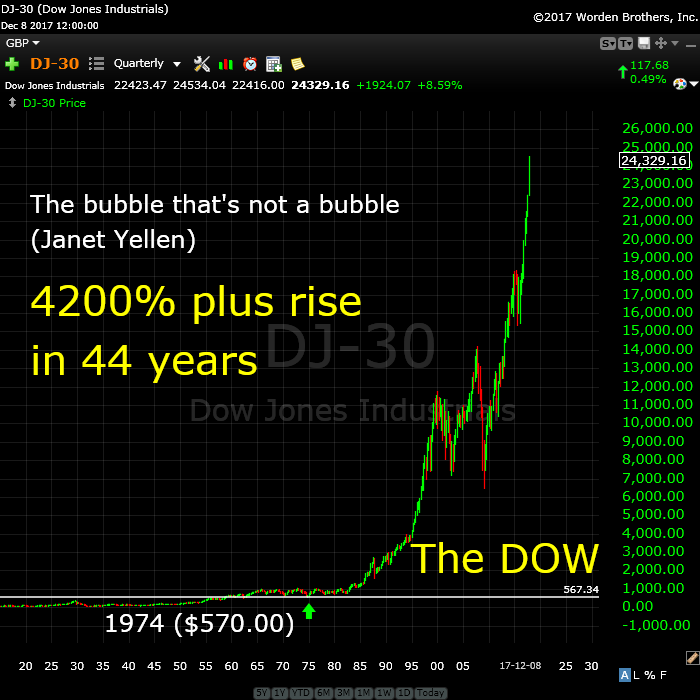 How about the biggest bubble in history, Janet? I think the chart otherwise speaks for itself. Above is the same chart as above, but as a log chart. This version exposes the underlying wave structure from before the crash in 1929, which was the second wave. The fourth wave of the third was in 1974 and this is typically the area a major correction would revert back to. I’ll let you contemplate that. 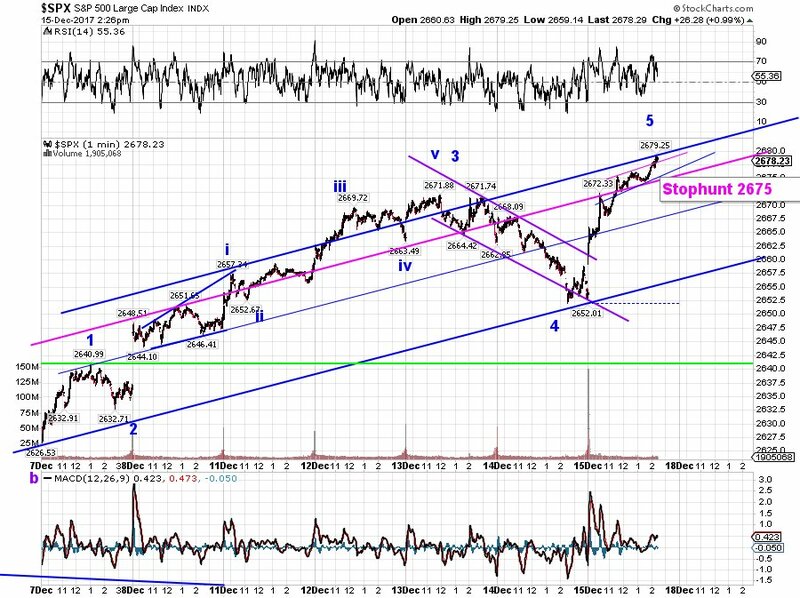 This wave count brings into contention Bob Prechter’s assertion that you can’t have an “irregular top” (page 58 of “The Elliott Wave Principle). However, Ralph took great pains to discuss the phenomenon in great detail. If you’ve been reading this blog for awhile, you know that I’ve been maintaining the final wave up (wave B) is corrective. I have been unable to come to any other conclusion given an analysis of the subwaves. The wave being corrective also support this count. I have no other option that to label the final wave a B wave (that I can come up with, at any rate). And finally …. fiat on steroids! 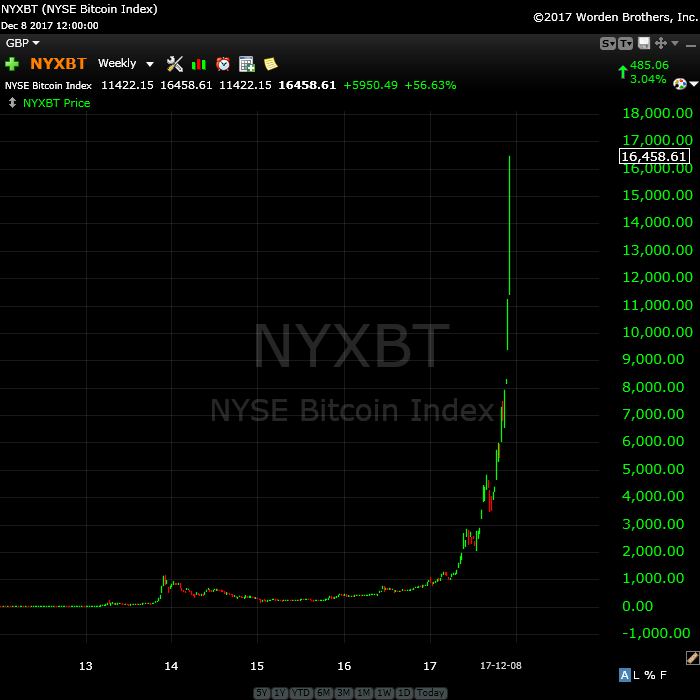 Above is the weekly chart of the NYSE bitcoin index. Note that it’s generally agreed that bitcoin has no intrinsic value (hence my comment above on “fiat on steroids). Blockchain, the technology it’s built on is a method or securing the transactions in a way that makes them impossible to lose, unless hacked (and we’ve already seen some of that!) Everyone seems to be focused on the technology, not on the fact that it’s subject to the same market forces as other fiat commodity (or currency). However, this is not a currency; it’s a speculative commodity built on a new technology that has uses in many areas, but not necessarily as a currency. I wait to see the outcome. To me, it’s obvious. We're now down to hourly charts for all the action. It's been a day trading environment for the past few weeks. Volume: With the sharp drop this week in a fourth wave, volume has spiked, as would be expected. That's the selling starting. However, we still have one final high left to go. Summary: The count is full for the US market in general, except for small subwaves that form the balance of a motive set of waves in SPX and some other major US indices. I put us in a final triangle in ES (either a conventional converging triangle or an ending diagonal—it's too early to tell which one it is). For the Nasdaq, we look like we'll get a final 5 waves up to a new high. There's no question that ES is tracing out a triangle, but what kind of triangle is still up in the air. The obvious indicator was the wave up to a new high on Monday, December 4. This wave up was in three waves—no question about that! I've started to label the points of the triangular structure. A contracting triangle (labelled in letters, because it's corrective) would include the fourth wave. An ending diagonal is labelled with numbers (because it can be found at the ends of both impulsive and corrective waves) and is a fifth wave pattern (it does not include the larger fourth wave in its structure). Because the C wave of a triangle (or 3rd wave of an ending diagonal) is the usually the most complex wave, and because NQ needs to drop in a second wave, I would expect ES to drop to a new low slightly below the c wave (to the area of the lower trendline). It's otherwise too early to provide much more information. However, my preference leans towards an ending diagonal as NQ looks like it has a full five waves to trace out, which will take it to a much higher high. Short term: The wave count is now virtually complete. We're tracing out a final triangle in ES, which is a final pattern before a trend change. NOTE: No Chart Show on December 21—cancelled. back to the primary count……………..ED w5! I will be pulling a Roy Moore this weekend! And no I do not mean with young girls! I will stay short SPX until my account is completely blown up! or at least until I get 8 more points back to the downside to break even.. hehe!! hmmm……has met all the criteria………………………..waiting on hard price reversal? Probably an A wave of a ZZ for five completed today. If so, lower for the B wave next week and a blow off C to end the fifth and final wave. Today’s price action I think highlights the inability to forecast with high reliability, market moves based on astrology. Directional calls were all incorrect as we saw new ATHs. In this regard, it seems to me the EW model much more reliably presaged the price action today. Just one man’s opinion. Have a great weekend all! I know it does not invalidate the ED but I am a bit thrown off by the time extension of the third wave. ED third waves generally compress in time as well as points…. For what it’s worth, the quick reversal had me contemplating the possible end of the ED. The fact that the initial move down was arrested giving that long lower wick caused me to immediately reject that idea. When the ED completes,the move down will not be stopped…simple! Perhaps the rapid takeaway was “muted” because it happened in the last 30 minutes ….and further complicated and limited by expiration of futures and options. I agree that “ending decline” will be breathtaking! Why can’t this chart still be right? Your wave 5 of the ED means it can’t longer than wave 3. That means wave 5 can’t be over 45.35 points or exceed 2697.36. Peter T, would you chime in on the Luri’s ED idea? Luri, I am referring to your chart posted at 2:24pm…not the one you are leaning to posted at 2:35pm. all is possible. The ED chart of which you write is on the table. I am throwing out options as to this pattern…… and others. I am beginning to think that the markets ability at “price discovery” will never be allowed to return. If i wasn’t aware of the documented plan of the central banks for a “money standard shift” – ie, the reset of the money standard to a single currency controlled by no nation, but by the banking cartel itself – with a long term move into pure digital currencies – i would have “abandoned” the idea of “price discovery” returning. The only way to break the dominance of the US dollar, and the military machine that enforces its dominance, rearranging cash flows for the hidden cabal that control “global governance” – is to completely crash the global financial markets – which is why they created this absolute bubble. whereas one could survive a drop from 10 stories, nothing survives a “drop” from 100. Bankruptcy of the US which must proceed the money standard shift was written about 30 years ago with a goal date of 2018. The “one way” global carry trade that exists since the 2009 ‘death of markets’ is through design. On slaughter day, the maximum pain must be inflicted in the shortest period of time……….to “shock and awe” the global population, so that global leaders have no other choice then to ‘reset’ to a new type of Bretton-Woods. So, rather than look soley at chart patterns – i research “play book” patterns. The play book is always the same……………so for me, i am looking for an “event” that will conveniently “rip” away CB control of the markets……They have created so much “tail risk” [by design] its hard to follow, N. Korea for example, and now war drums AGAIN against Iran…….. the list is too many……. the playbook with each “tail risk” is to “create” a “teflon market”…….a market that only goes up…..and does not respond to tail risk – until it does…..
What is the “takeaway” from the chart you provided the link to? Is it that price discovery doesn’t exist much anymore? the posted chart from ponzi world……… is a ratio. 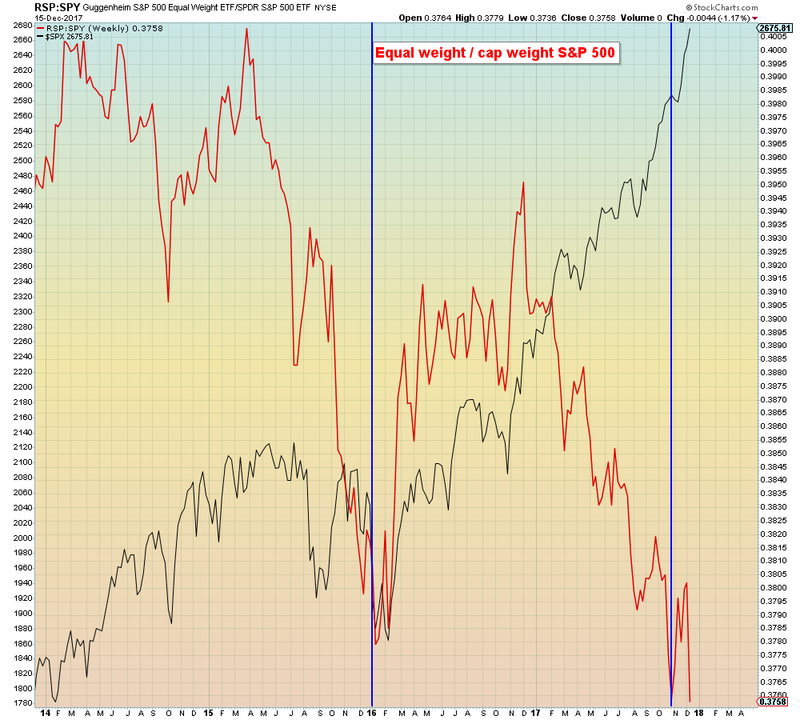 it is a ratio of the “equal weighted spx” to the weighted one. Its a another take on a breadth indicator….. said otherwise, fewer and fewer stocks are participating in price advances of the index….. so much so, that the “ratio” is at historic and divergent “extremes”……. the writer of this blog uses this ratio to gauge “potential” market breakdown and crash. The extreme ratio indicated today generally comes hand in hand with large price dislocations [ie, crashes]………………. the takeaway – all markets and all prices are now “managed” [rigged] – until such time as the bankers no longer want it managed [rigged]………. for the reason of furthering their own long term “agenda”…………… at that point, they “allow” for prices to find their “fair value” – and as the ratio shows – an “epic crash” in prices……………. tail risks are usually aligned to astrological alignments meaningful only to “them” [the governing ones] ……………. an example [david rockerfeller died on the spring equinox 2017 at the age of 101 – numbers and timing for the illuminated ones]. tail risk ……”ignition potential”………….. definitely this weekend into next week for the winter equinox………. we had the 2017 year with a rare solar eclipse and the biblically referenced “astrological alignment of 9/23”, and the spring death of one of their visible leaders [d. rockerfeller] …………… the week of 12/21 is a week of “note”…………. Monday will be a high. But Friday 22 is the strongest vibration this month and will bring a high. 12/20 is the strongest day in between and will give a low. From 12/22 the vibrational cycle is down into 1/1/18. In between we will see a low in the long weekend and then a retrace into 12/29 when Venus is conjunct the Hc node of Uranus. We are currently in a cycle down from 12/2/17 into 8/20/2023. The first leg down will end 7/8/18, a strong vibrational date. 8/12 is 10k PI from the 1932 low so could be tested. But this period will give a low. 106 months from 2009 gives 1/4/18. 1/5/18 is a strong vibrational day and will be a high. Vix gives a low 1/12 and 1/15 is a strong vibrational day. So 15 will be the high with a low 1/9-10. Then 1/20 low. From 1/15 the market will get more volatile. The next few days some major cycles turn. That will speed things up a bit. But there is no turning back; 12/2 was a critical date. I am trying to get some clarification of what you mean by “cycle down”. I think sometime previously you indicated that did not necessarily mean no new all time highs as price may sometime deviate. Am I correct then in presuming that your comment on our being in a cycle down since 12/2 does not preclude additional new all time highs in the market? Sorry if you already explained this as I seem to recall…. It is common for ending waves to go against the trend. So yes, it may go up a bit. Point is that when it turns the trend becomes dominant. Time is running out. 12/22 is a strong vibration. And – as explained – vix wants down into 1/12/18. So 1/15/18 is very significant. The key point is that we are in the very last days of the 2009 bull run. Take note of 8/20/2023. Will take some time before we get there, but that is the vibrational cycle. You will see. I now see also a low for monday and a high for tuesday. So monday high/low, Tuesday high and Wednesday low. Despite the plethora of reasons to be bearish, this market has continued to defy logical technical expectations for years. After looking at the charts, the new highs invalidated my own preferred count and it now looks to me like a new upside target of 2730 has to be considered. I don’t like it, but likes and dislikes have nothing to do with what Mr Market does and we simply must assess the price action we see objectively. I will consider a close above 2680 as increasing odds of reaching higher target. i went to this guy’s current post from his site,,,,,and they too are following the skinny ED – exactly the chart i posted…… the only difference, he is deep into the specifics of EW, whereas, i am more akin to an EW summer breeze…. so he says wA of w5 ED is done….we had a quick wB “potential” – wB could get complicated and go lower….and then wC……. Wrong. We’ve just completed wave 3 of the ED. There simply isn’t any question about that. I obviously have no idea what I’m talking about, then. I will be quiet. I don’t know what everyone’s excited about. We still have a Santy-rally to go. If we have a continuation of the Santa Rally, then my anticipated target for price may not be that far-fetched. I was a bit conflicted about what I see as a likely target with a close above 2680, and the need for a limited range for wave five in an ED. If Peter T is right about our having just completed a wave three of the ED in ES the cash index should do the same on Monday with new a new high. I have no clue what is going to unfold but I do think short term is indeed bullish. As I said the zig zags seem weirdly proportioned so I guess I still have few things to learn about Eds. Great Chart! Thanks for posting! Also appreciate your explanation of the chart you posted from Ponzi World. Why wouldn’t the insatiable appetite for ETF distort the A/D line that Peter has posted about? When someone buys an ETF they are indiscriminately buying stocks with great fundamentals…but they are also buying stocks that have poor fundamentals and who possibly are losing money! Good point Ed. The quant guys consider passive investing via ETFs, which has absolutely exploded during this cycle, as part of the “synthetic short” of volatility cohort. They could indeed be a source of market metric distortion. I know personally all kinds of signals I use to monitor no longer work with any consistency – things like movement above B bands. We just had a manic market move higher after very clear bearish signals such as a turn down in OBV, and bearish engulfing candles. This is one tough market to trade. I no longer take anything for granted, and every prognostication with a huge grain of salt. Not that I am finding fault with others mind you; as I indicated many signals I use to be able to rely on would now send me right off the cliff If I fully put my trust in them. How does someone access the Ponzi world blog site you mentioned? It’s supposed to be 2016. If it is, then the uptrend from the Dec. 1 low may stretch to early February. That said, perhaps markets may have a scary sell-off late next week or early January synchronized with a BTC low. Perhaps BTC will have its own version of flash crash sometime in January and affects the markets. Year of the Fire Rooster ends on February 15, 2018. I spent time yesterday looking back over various posts and stumbled back onto your post on December 2nd siting Jason Goepfert. There was a new high in the SP500 coupled with the VIX up over 5%. Value Line Geometric Index be more revealing about what might be dead ahead? Over the next few months there are going to be some seismic events in the world of EW theory. Prechter and company and Peter T agree that this bull run is at or near the end. Some very able analysts contend that we are only at the top of a high degree third wave and have a major fourth and fifth wave left to go possibly lasting over one year. Clearly both camps cannot be right. Another analyst I greatly respect Lara Iriarte also counts just the top of a intermediate three with a P3 and P4 yet to complete prior to a final top which means probably well over a year if that is correct. She also cites the absence of A/D price divergence as pointed out by Lowry’s. I find it fascinating that there could be so much variance among analysts applying the same rules and using the same methodology. In the next few months, there;s gong to be a major shake-up in the world of EW analysis with some folk emerging as world class gurus and others wondering what they missed! Exciting! I have to confess I have never fully comprehended the EW postulate that price and therefore the waves are determined ONLY by sentiment of the herd. No one disputes the effects for example of QE on price. We can clearly see it in the charts. No one denies share buy backs boost share price. The evidence is incontrovertible. Can anyone explain how central banks and CEOs figure in price and wave formation in EW theory?